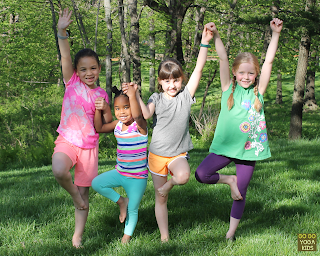 The following is a guest post by Sara Weis, adapted from her book Go Go Yoga for Kids. Introducing kids to yoga doesn’t have to be a crazy and wild adventure. 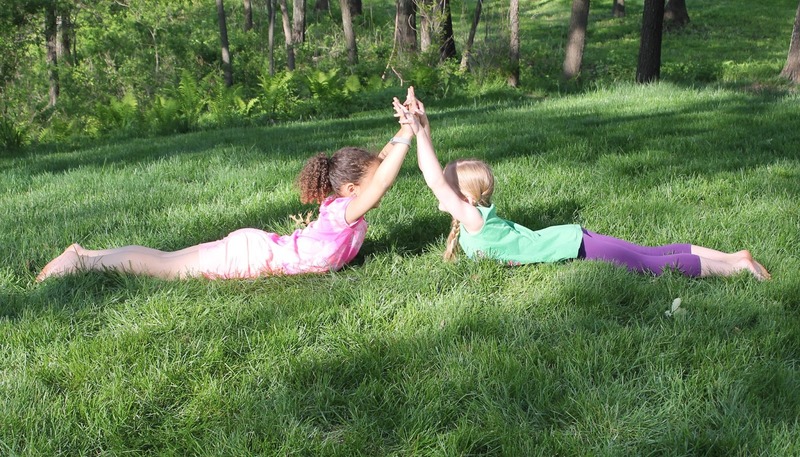 By following these fun jungle-related yoga poses and games, kids will have a great time exploring the jungle while they also get fit, flexible and focused. As with any yoga class, it is always good to start settling in by focusing on your breath and being mindful of how your body feels. To do this, begin with Elephant Breath. Stand with your feet shoulder distance apart and clasp your hands in front to make an elephant trunk. Next bend at the waist and inhale through your nose as you raise your arms up over your head and lean back. Exhale through your mouth as you swing your arms down through your legs. Once you have your breath and body warmed up, it is time to begin with some Jungle Yoga Poses for Kids. Lion: Be a lion in the jungle by getting on all fours. Take a deep breath in and arch your back in Cat Pose. Then let your spine relax as you look up in Cow Pose. Let out a deep “Roar” on each exhale. Cobra: Lie on your belly, place your hands under your shoulders, and hug your elbows into the sides of your body. Press through your feet and gently lift your head and chest off the floor. Can you hiss like a snake? Giraffe: Move into Tree Pose by bringing your foot to your calf and placing your hands at heart center. As you become more steady, bring your foot to your thigh and move your hands overhead for tree branches. A tip for holding tree pose is to focus on a spot on the ground that is not moving. Elephant Pose: Become an elephant as you move into a one-armed Down Dog Pose. Swing your “trunk” from side to side. Jungle Explorer Yoga Game: Now it is time to practice all of these fun yoga poses by playing the yoga game, Jungle Explorer. Choose someone to be the Explorer. While music plays everyone else becomes jungle animals and moves throughout the jungle. When the music stops, all of the jungle animals must freeze while the Explorer moves around the room to see if any animals are moving. If the Explorer spies an animal moving, he or she taps the animal on the shoulder and that person then becomes the next Jungle Explorer. Kids also love working in partners and groups with yoga poses. Partner and group yoga poses help build confidence, mindfulness of others, and community. Have the children try Double Cobra Pose while lying on their bellies and facing one another. They can then press their hands against one another and lift up their heads and shoulders. In Group Tree Pose the children stand in a circle while in Tree Pose with their hands held together or on one another’s shoulders. After all of that exploring, it is time for the jungle animals to rest in Savasana. Everyone can lower themselves onto their backs and lie as still and quiet as a little mouse. Breathe in and out through your nose deeply and know that you have made your body and mind stronger. This Jungle Yoga Adventure with yoga poses and games helps kids become aware of their breath, body, and the benefit of working together. By having children change their position and poses in several ways, it can help them modify their mood, awareness and actions both inside and out. 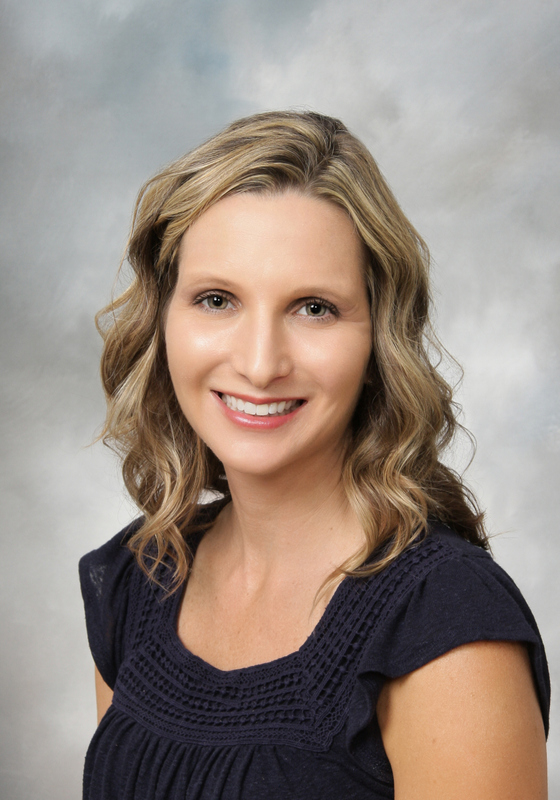 Sara Weis is a leading expert in yoga for kids, bestselling author of Go Go Yoga for Kids: A Complete Guide to Using Yoga with Kids, and creator of the Kids Yoga Challenge Pose Cards. She has over 17 years of experience teaching in the public schools and has led hundreds of kids' yoga classes. She is a certified kid and adult yoga instructor and holds a Master’s Degree in education.